Click on any of the small pictures for information and images of that character. Character synopses, histories, and relationships are sourced from The Lion King, The Lion King 1 1/2, and the hardcover children's book A Tale of Two Brothers released in 1994 by Disney, written by Alex Simmons. This book is not strictly "canon" anymore, in that some of its content (namely the cub Kopa, Simba and Nala's son) has been contradicted by the release of The Lion King 2: Simba's Pride. However, its accounts of the events prior to the beginning of The Lion King with regard to the origins of Mufasa, Scar, Zazu, and others, remains uncontested. Therefore it is still considered "canon" on those points. This site shows only the principal named characters from The Lion King. For an authoritative listing of all canon characters from all the Disney movies, TV shows, books, and comics based on the Lion King universe, see the TLK Compleat Character List compiled by Criswell. 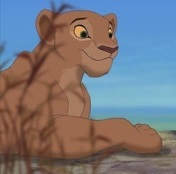 Nala's mother is Sarafina, one of the pride's lionesses and a friend of Sarabi; the question of who her father is remains one of the mysteries of The Lion King universe (though directors Rob Minkoff and Roger Allers have personally, though reluctantly, acknowledged that it must be either Scar or Mufasa). Nala is a close friend and playmate of Simba, with whom she's never afraid to go exploring or get into mischief. The Pride's traditions dictate that Nala and Simba will one day be Queen and King together; but when Simba is lost after Mufasa's death, she devotes her life to providing for the pride as the Pride Lands fall into ruin. Scar eventually comes to see Nala as a prize, a Queen to his own throne (a subplot that is more fully explored in the Broadway Musical than in the movie); but she spurns him and chooses instead, in desperation, to leave Pride Rock and search for help from outside. The last thing she expects, though, is to find Simba alive again. Mufasa's lineage is known only through A Tale of Two Brothers, a children's book published at about the same time as the original 1994 release of The Lion King. In this book, Mufasa's father is named Ahadi, his mother is Uru, and his brother Scar has the cubhood name of Taka. As a king and leader, Mufasa holds a deep understanding of the forces that make the Pride Lands balanced and healthy. His duties as King of Pride Rock include managing the hunting by his own pride and other creatures, and resolving disputes over feeding and watering grounds, to ensure the land's resources are not exhausted; he also must patrol the boundaries to drive out interlopers and prevent such crimes as killing for sport. Of course, he's also responsible for raising his son Simba to be a wise king like himself—a responsibility that Simba may not yet be ready for. The younger brother of King Mufasa and second son of Ahadi and Uru (as told in A Tale of Two Brothers), Scar was known as Taka until an incident in which he ran afoul of some Cape Buffalo (in a botched attempt to embarrass his brother Mufasa) and was struck on the face with one of their horns. He took the name Scar at the urging of his father to remind himself of the price of pride. However, this lesson is lost on him in later years, once Mufasa becomes king; Scar, ever the more conniving and subtle thinker of the two brothers (though by far the less concerned with the well-being and good governance of the Pride Lands), increasingly becomes convinced that the throne of Pride Rock is his by right. When Simba is born, Scar loses his position in line to inherit the throne from Mufasa; so owing to a pact he had made in his youth with the three Hyenas, he develops a plot to kill his brother and nephew and seize the kingship by force. Zazu is the steward and majordomo to the King of Pride Rock, as his family has been since the time of Ahadi, when (as is told in A Tale of Two Brothers) Zazu's mother Zuzu was recommended by Rafiki to the king's service as a lookout and carrier of messages keeping the king informed of happenings within his lands. The amiable warthog Pumbaa is cursed with the ultimate in social stigma: uncontrollable flatulence. His family background is a mystery, but his story from the point when he meets up with the meerkat Timon tells us all there is to know about his sad exile from the company of those who can't abide his smell. 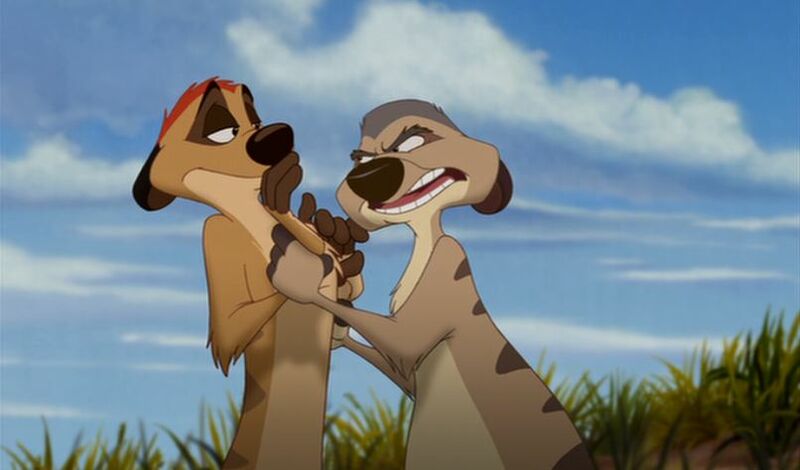 Dull-witted but packed with common sense, Pumbaa uncomplainingly shoulders the burdens of Timon's selfish quests, as the most important thing to him—surpassing all else—is loyalty to his friends. He wants to be useful, and he wants to be wanted; and what else, aside from his strength, can he offer a friend? Pumbaa's steadfastness makes him the partner anyone would wish to have when the time comes for Simba, who had been raised by Timon and himself in the luxurious ease of the jungle, to return home to Pride Rock and challenge his usurping uncle Scar. Pumbaa unhesitatingly follows Simba and Nala into battle—for he knows the value of duty, hakuna matata or not. 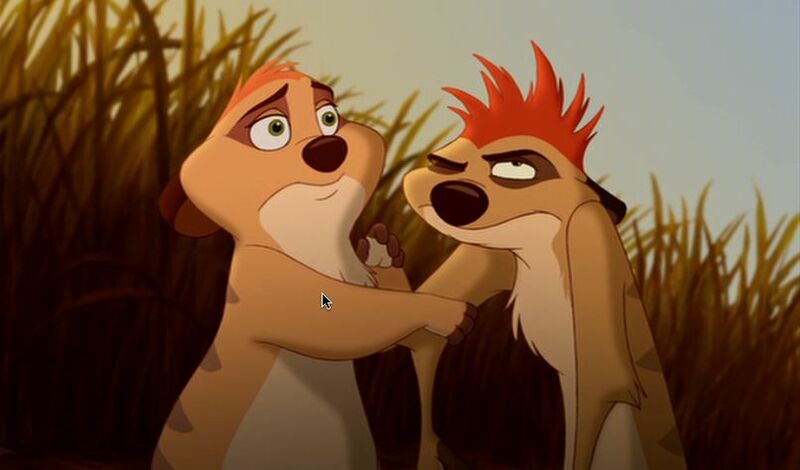 His loyalty to the needs of his friend Simba eventually overpowers Timon into following Pumbaa's honorable example. Shenzi (the female leader of the pack of hyenas), Banzai (the male), and the moronic Ed are old enough to have terrorized the Pride Lands back in the days of Ahadi, according to A Tale of Two Brothers. In Scar's youth, the trio struck a pact with the younger lion prince to bring him into their clan, initially to circumvent and undermine the king's restrictions on their hunting for sport, but eventually perhaps because they saw as much opportunity in a partnership with Scar as he did in them. It was the Hyenas who inspired the young Scar's first stirrings of malevolent trickery against his brother Mufasa, and his disinterest with the affairs of ruling (aside from the appeal of its raw power) led him to spend his time growing up among the Hyenas and their destructive schemes. When it comes time for Scar to move against his brother and nephew, he calls upon the aid of his Hyena henchmen, who by the time of Simba's birth have become lazily subservient to him and his ability to provide food and diversion for them. They're clever enough to be employed in creating a deadly stampede that results in Mufasa's death and Simba's exile, and they are rewarded richly with positions of power and privilege within Scar's kingdom, even surpassing the status of the lionesses of Pride Rock, throughout Scar's destructive reign. However, the Hyenas are also smart enough to realize, when Simba returns for vengeance against Scar, when the usurping king has double-crossed them in an attempt to save his own skin; and they get the last laugh when Scar falls at their feet, cast down and at their mercy. They are not inclined to give him any.